San Francisco: In pre-gas crisis 1970, the Big Three ruled the American marketplace. A small number of little Toyotas and Datsuns plied the streets, Honda had just started marketing the cute, microscopic 600, and the Civic was still in the design phase. Mazda and Subaru had yet to bloom, and Mitsubishi was unknown. Into this world came the startling Datsun 240Z. It was a two-seater, with a long, low hatchback body, pointed nose, sleek sides, and a strong six-cylinder engine under its long hood. Strangely, the Z’s road has not been straight or smooth. As the 1970s wore on, the car grew in displacement and size to 260Z, 280Z, and then to 300ZX in the 1990s. By the mid 1990s, oversized and overpriced, the car lost favor and was dropped. 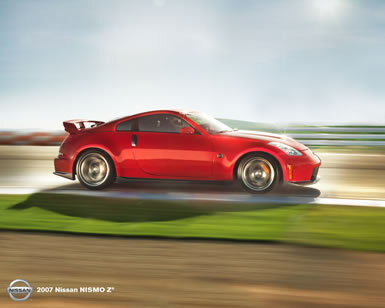 But the Z came back to life in 2002, with radical new styling applied to the classic long-wheelbase, short-overhang proportions. Pounds were trimmed, prices were slashed, and suddenly, the Z was a real competitor again. Today, this model is 5 years old, going on 6, but retains plenty of wow factor. Like its forebears, it has gained power through the years, and now flaunts a 306-horsepower V6 under its hood. Combined with 268 lb.-ft. of torque, Nissan’s powerhouse still thrills. And this engine, now in its fourth generation, has received a “Ten Best Engine” award from Ward’s Auto World magazine for 14 straight years. Nissan made many changes to this year’s engine, from installing twin knock sensors to boosting the compression ratio to tuning the engine’s sound for maximum enjoyment. You can order your car with a close-ratio six-speed manual or a five-speed automatic. The Automatic costs an extra $1000 and nicks you slightly in fuel economy and on the pollution index. Per the EPA, the 2007 Z, with manual transmission, earns 20-mpg City and 27-mpg highway. The automatic gains one in the city but loses one on the highway. I averaged 18.3 mpg. The agency’s Green Vehicle Guide gives models sold in California and the other “green” states a commendable 7 for Air Pollution Score (6 in the rest of the states). For the Greenhouse Gas score, the manual transmission-equipped models get a 6 while the automatic vehicles earn a 5. You can buy a 350Z as a coupe or roadster, in a range of models. My tester was a coupe. The base car has plenty to offer, including the hot engine. Standard equipment includes power windows, power locks, automatic temperature control, a lockable rear luggage box behind the passenger seat, and more. Three other flavors are available for coupe or roadster (there is not a base model roadster). The Enthusiast model adds aluminum pedals and Homelink transmitter, and for performance’s sake, a limited slip differential, traction control, cruise control, auto-dimming mirrors, and illuminated steering wheel controls. The Touring model upgrades the audio to a seven-speaker Bose system, applies leather to heated seats, and throws in the Bluetooth hands-free phone system. The Grand Touring, like my test car, has “the works,” with front and rear spoilers, powerful-looking alloy wheels (18 in front, 19 in back), and mighty Brembo disc brakes, which you can admire through the RAYS wheels. My tester wore Solar Orange, one of three new colors for 2007, standing out wherever I parked it. The Z has a tough, hunkered down look about it, from its flat face with wide, low grille and staring headlamps to its unusual vertical aluminum door hands to its extended, pointed taillamps. Inside, the drama continues, with a swept-back dash, minimalist door shapes, and some sporty-looking bucket seats for two. The three-gauge instrument panel is reminiscent of the original Z. Ancillary gauges poke their heads out of the top of the center console, just as they did in 1970. Metallic accents raise the level of sparkle a bit. Once you settle in, there’s enough room in the Z, and I didn’t feel claustrophobic. The rear strut tower brace cuts across the storage area, but it does wear a large Z logo that’s visible through the rear window. The manual gear changes are enjoyably taut, and the car leaped ahead when I let out the clutch. It took me a day to get used to the way the power is applied immediately to the road. It’s on freeways when you realize that the Z is not a cruiser. The suspension transmits every surface change and bump to your behind, a very desirable behavior on sporty back roads and the racetrack but less so during a commute. Prices start at $27,900 for the base coupe, running up to $36,100 for the Grand Touring model. With options, including navigation system, my tester came in about two six-packs short of $40,000.